The modern electronics retail industry in Indonesia is still very young, and it is my vision for Electronic Solution to take a leading role in driving its continued development. PT. Electronic Solution Indonesia is a leading retailer of electronics, home appliances and gadgets, with an extensive network covering Indonesia in its entirety. What more can you tell us about your company’s history and its main strategies going forward? Our business was founded in 2005 as a PMA company backed by investors from Singapore looking to Indonesia as a market of huge potential for retail industries. Following a restructuring of the Singaporean holding entity in 2009, we established two companies as franchises of the PMA – both of which are fully local. As President Director I oversee the management of these different units, as well as own one of the franchise companies, PT Elektronik Sukses Indonesia. Together, these companies are involved in the retail of electronics, gadgets and home appliances through our market-leading outlet brand, Electronic Solution. For the future, we have plans to build upon our success over the last decade by expanding our retail network in Indonesia through the addition of another 10-20 stores per year. 2014 was an interesting year for your industry marked by challenges related to the weakening rupiah but also buoyed by factors such as a rise in purchasing power. With this context in mind, what is your outlook for the electronics retail industry in Indonesia? The recent presidential election and strengthening of the dollar had a substantial impact on our industry, but our company was less affected than others. This has been confirmed by GfK - a market research firm that analyzes the electronics retail sector and produces a report viewed by major industry players as a benchmark and point of reference to understand the state of the market. Despite the difficulties over the course of the last year, our outlook for the future is still positive. Challenges related to presidential elections as well as macro-economic factors are not new; we managed to overcome a similar situation in 2009 and expect the electronics market to recover going forward. How does Electronic Solution differentiate itself from its competitors in Indonesia? Electronic products in different stores and even in different countries are mostly identical. Comparing retailers on the basis of products and price is a never-ending exercise, given this similarity. To stand out in the market, our company focuses on value added in-store services such as free insurance, extended warrantees and free delivery. How you provide your services to the customer is the key to establishing yourself as the market leader, and this was something we learned from our close analysis of overseas companies that have a strong position in markets such as the USA and Australia. The continued emergence of Indonesia’s middle class has brought about substantial changes to prevailing consumer preferences in the local market. What can you tell us about the latest consumer trends that you have seen in the market for electronics? Most of our stores are located inside malls, each of which caters to different segments of the Indonesian market. Instead of focusing entirely on a particular subset of the population, we seek to reach a wide consumer base and put in place different product mixes for varied needs. For example, for our outlets located in ‘C’ malls, or malls frequented by the low-middle class segment, we prioritize the provision of inexpensive electronics and IT solutions. Our stores in ‘A’ malls, conversely, are far more likely to carry top-end products such as 100-inch LED TVs. To adapt to a growing middle class, we have better prepared our ‘A’ and ‘B’ mall outlets to provide not only high quality electronics but also a superior level of service. This segment of the market is now beginning to move away from the concept of price as the deciding factor when purchasing electronic goods, gadgets and home appliances, and are more aware of service quality and the in-store experience. In which parts of Indonesia do you see the most potential for your previously mentioned expansion plan? 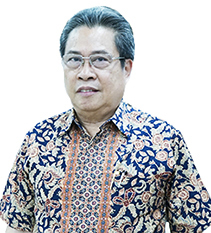 Sulawesi and Kalimantan are of interest to us, because we expect these parts of Indonesia to grow in line with a rebound in the country’s mining sector in the near future. We are already prepared to open several stores in these locations in anticipation of their substantial economic development. Indonesia is unique in the sense that malls here typically only have one electronics store, and so to stay ahead of our competitors it is important that we are proactive in setting up in malls across the country. What are your plans in regards to innovation and the introduction of new products to your retail outlets? Our company is currently taking steps to diversify our product portfolio to also encompass furniture, and we have already begun offering products such as mattresses, sofas and dining sets in several of our stores. Through this strategy, we hope to meet the needs of customers looking to furnish their homes in addition to buying electronics and appliances. It is our goal to become a one-stop shop for all household equipment. Multiple companies from overseas markets such as Europe, South Korea and China have already approached us, and we are currently in the process of discussing this opportunity internally. When working with international companies through joint ventures, we are most interested in entities that are able to bring in capital given that differences between markets makes overseas know-how less applicable here. As a well-established local company, we offer expertise in working with suppliers in Indonesia, and as such mainly require capital to facilitate our continued expansion. The modern electronics retail industry in Indonesia is still very young, and it is my vision for Electronic Solution to take a leading role in driving its continued development. Within the next 15 to 20 years, we hope to see modern electronics retail businesses surpass the still more prevalent traditional retail companies, because this will encourage the further entry of major electronics brands. As a final message, what would you like our readers to remember about Electronic Solution and Indonesia? Success in the retail sector depends on the strength of your relationships with customers and suppliers. As a company we therefore take pride in our standing as a trusted retailer of electronic goods.